Summer has been flying by and the weather it has brought has not been a typical New England summer. I almost feel like I am living back in San Francisco as more gray foggy days plague our sunny ones. Despite the weather, we are making the best of it sailing and working on our own and other boats. The most important thing to always remember is how lucky we are to have these great opportunities and continue to work hard and play hard to enjoy them. 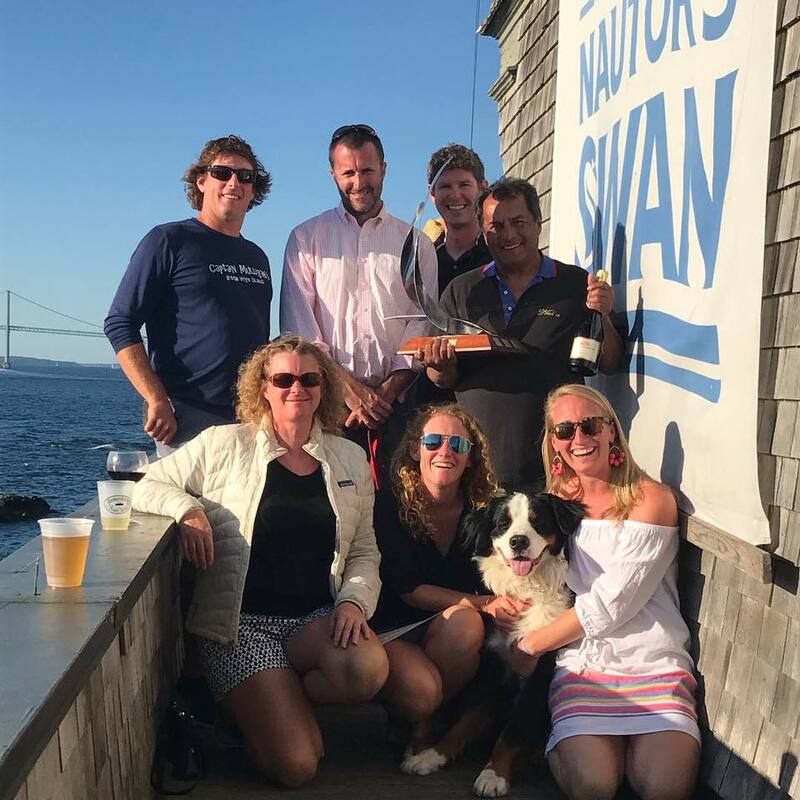 The weekend after the Marblehead-Halifax Race, I ran an event called the Designer Series Rendezvous in Bristol, Rhode Island. The idea of the event is to bring together yachts all designed by the same person in a weekend of activities. 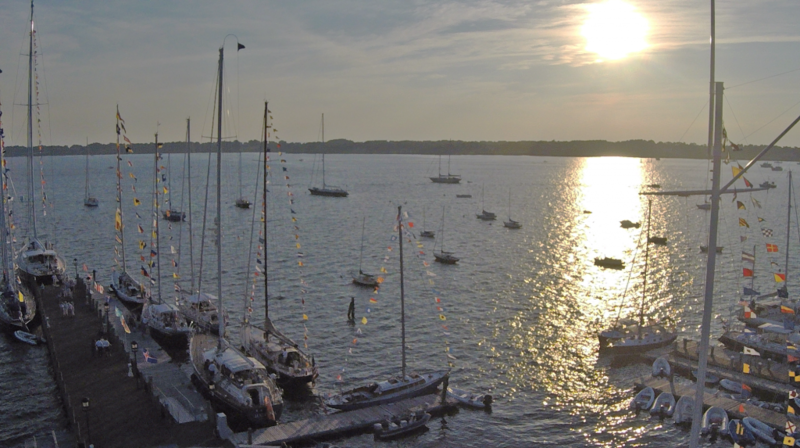 Our inaugural year honored Ted Hood, legendary yachtsmen, sailmaker, and boat designer. This event has taken exactly a year to plan and my client and I were thrilled with the results. We had over 25 yachts represented from Mr. Hood’s first design: a 40-ft Wooden Sloop, Robin, to his America’s Cup Challenger 12-meter, Nefertiti, to his last yacht, a 116-ft Sloop, Whisper and then all those in between. Brandon even managed one of the Little Harbors that wanted to attend the event at Jamestown Boat Yard, so it was still a family affair to get this event off the ground. The next weekend was the Swan Owner’s Association Rendezvous. As Brandon’s boat yard and work focused a lot of these prestigious Finnish yachts, this was a chance for them to reunite. 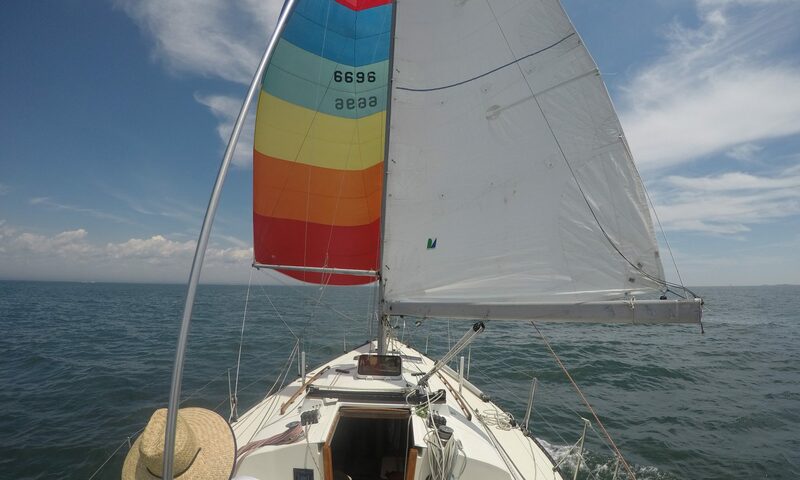 I sailed with our friends Bob and Kristen Beltrano on their, Swan 60, Nai’a. 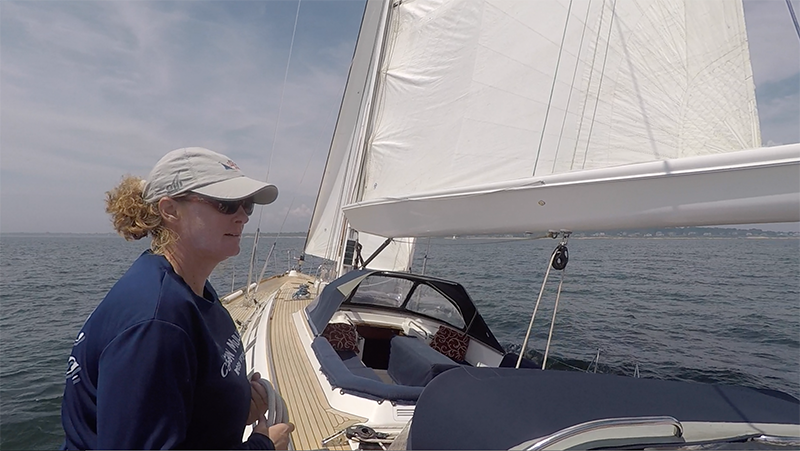 We have raced with them in the past both in this weekend and in the Carribean.Friday we attempted to race out to Block Island but there was no wind so we motored there but did get to cruise a little. 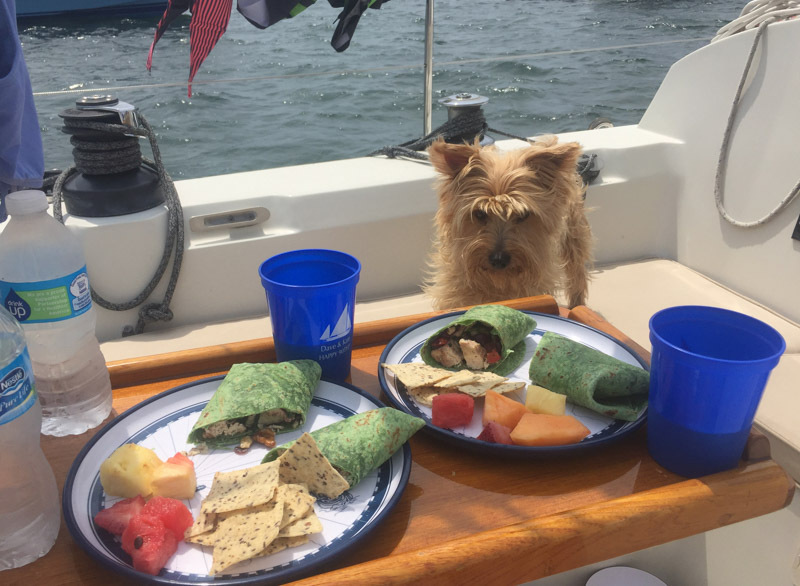 Friday we attempted to race out to Block Island but there was no wind until much later in the day so the racing was canceled so we motored there but did get to cruise a little with the sea breeze filled. 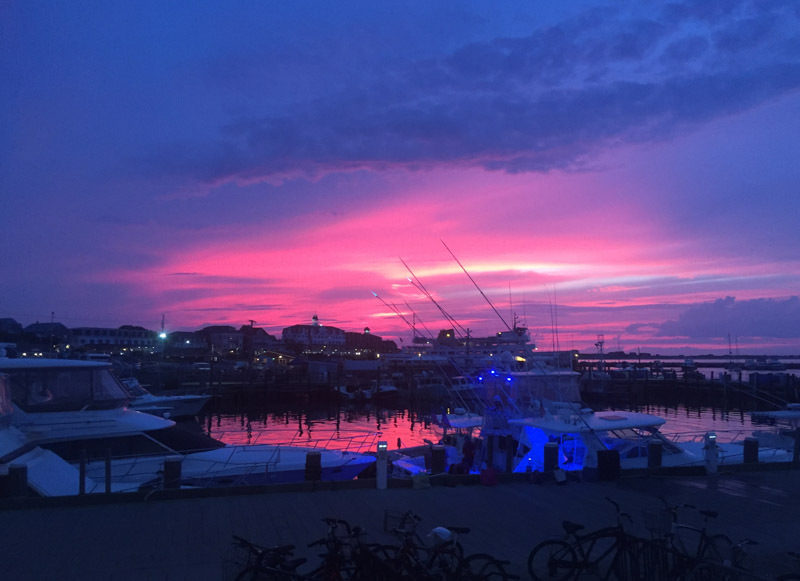 We got a mooring and the event hosted a Lobster dinner at Ballards under a beautiful sunset. Saturday was a North Easter in July! 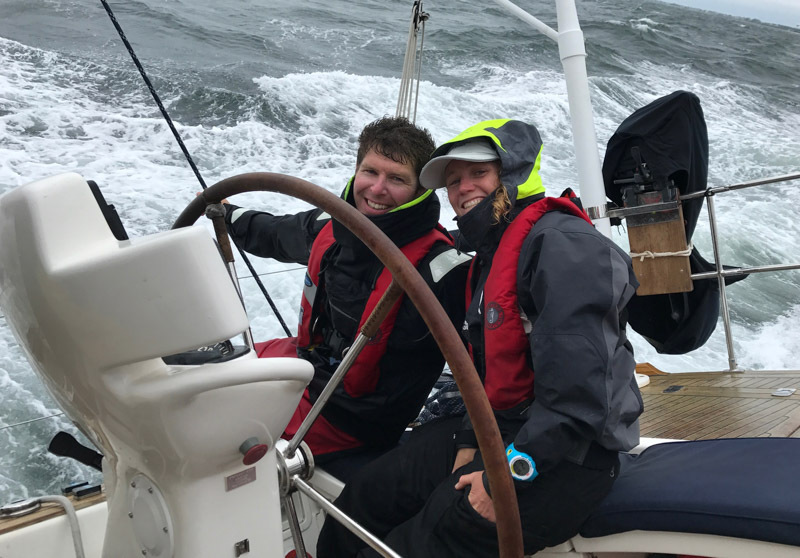 We all bundled up in our full foul weather gear and life jackets to race back upwind to Jamestown under a double reefed main and reefed jib. Sitting at the helm, I watched the B&G instruments hit 40 knots multiple times. We were safe but it was not the most comfortable of rides. I learned an important lesson on fire safety on yachts as we hit the dock and immediately we smelled that putrid smell of an electrical fire. Due to the big breeze, the bow thruster on Nai’a had been going full on for about 10 minutes as we docked and due to a faulty connection, the hydraulic motor started burning up. However, in the initial mintues, we didn’t know if it was a fire or not on board. I realized in a moment that I didn’t know where the fire hydrants were. Luckily, aside from the smell and the motor needing repairs, everything was fine but now I know to always ask and learn where fire hydrants are even if it’s just a day sail. Sunday we raced around the Island in a NorthWesterly (Also odd for a sunny summer day in the summer). 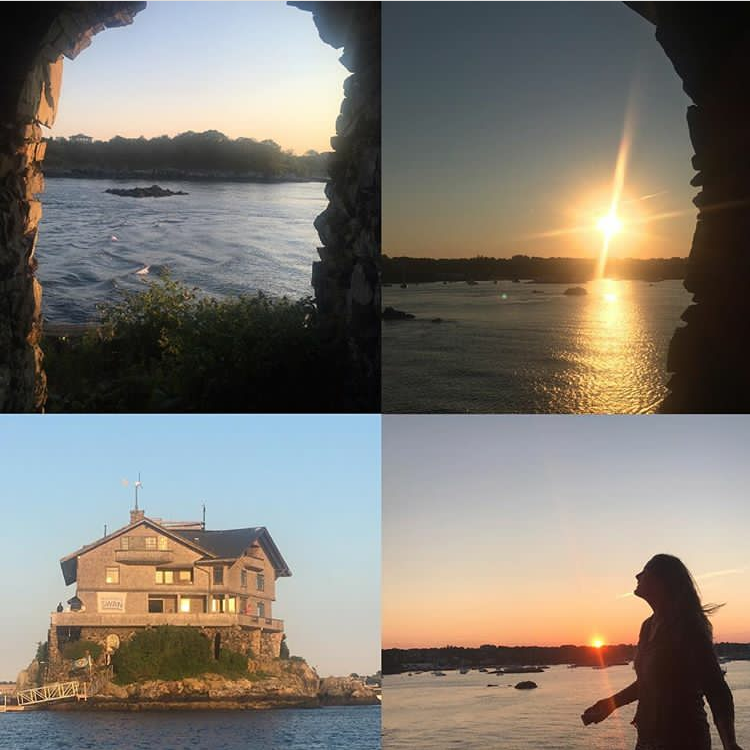 The weekend wrapped with a party on Clingstone, also known as the house on the rocks. The best part was we won! Nai’a claimed the Highland Fling Award, named for a famous Swan racing program. Winners! Clockwise from Upper Left: Walter, Andrew, Brandon, Bob, Maria, Moose, Me, and Kristen. Jamestown Boat Yard helps maintain the work boat for the house so, in exchange, the yard rents the house for a week each summer. It’s such a unique place. There is no connection to the mainland so it runs on just solar, wind, and collected rain water. The inside is just as rustic as the outside. Monday night, we all went out just to have a cookout and relax to watch the two sunsets. Why two? because you can get one sunset on the lower deck, then run upstairs and get a second sunset on the deck on the roof! After two weekends of “working,” we were finally able to get away on our own boat. We had no plans except to provision for the weekend and head out of the harbor. In the end, we decided on Block Island because it was blowing from the SouthEast and we could actually make it there on one tack. 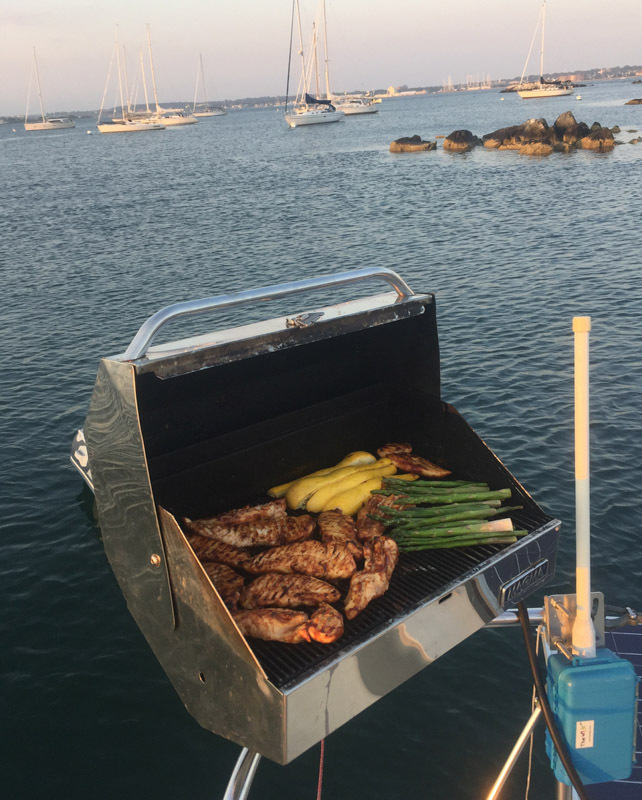 We left around 5pm on Friday and were dropping anchor and cooking Steak Tips and Corn by 9pm. 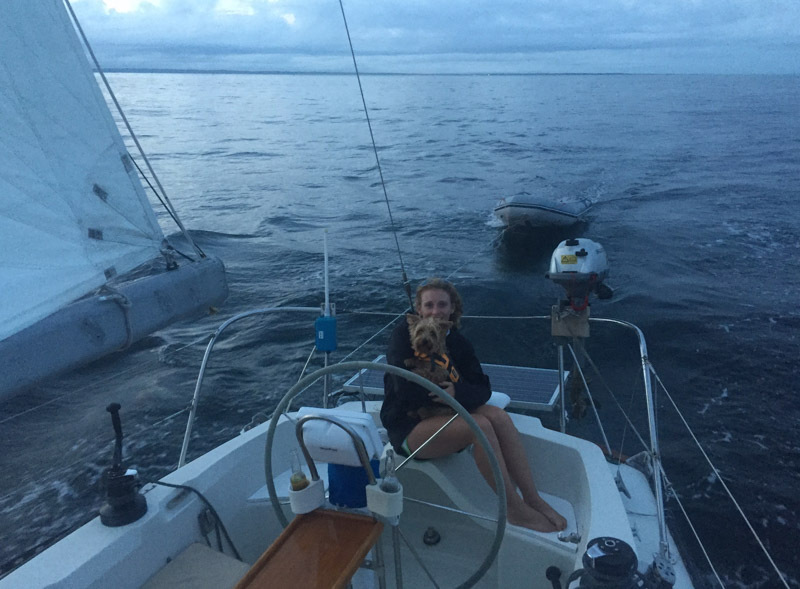 Scruffy and I on the way to Block Island just after sunset. Saturday followed the trend for the last few weeks of just being miserable. It was windy and rainy and except for a quick trip to the beach to give Scruffy a walk, we didn’t leave the boat until 5pm. 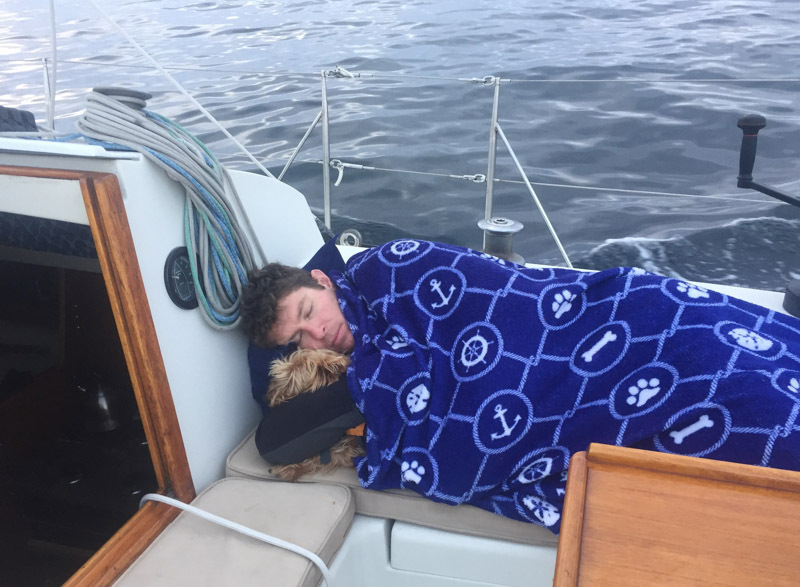 Brandon and the little dog caught up on sleep in the Vberth and I caught up on work thanks to the power of an unlimited data hotspot and the inverter. Friends of ours rented a house on Block Island and by 5pm it was a gorgeous evening so we loaded the folding bikes into the dinghy and went ashore to have dinner with them. I brought some Tuna Steaks from Dave’s Market and had them marinating all day in Ginger Teriyaki sauce. MMmmm…. Saturday night, was a night of waking up to check on the mooring field quite a lot. Block Island gets really crowded on summer weekends and when the wind shifts in the middle of the night, it can get interesting if one boat doesn’t swing the same as everyone else. Despite a giant catamaran getting closer than comfort to another boat close to us, it was all fine. 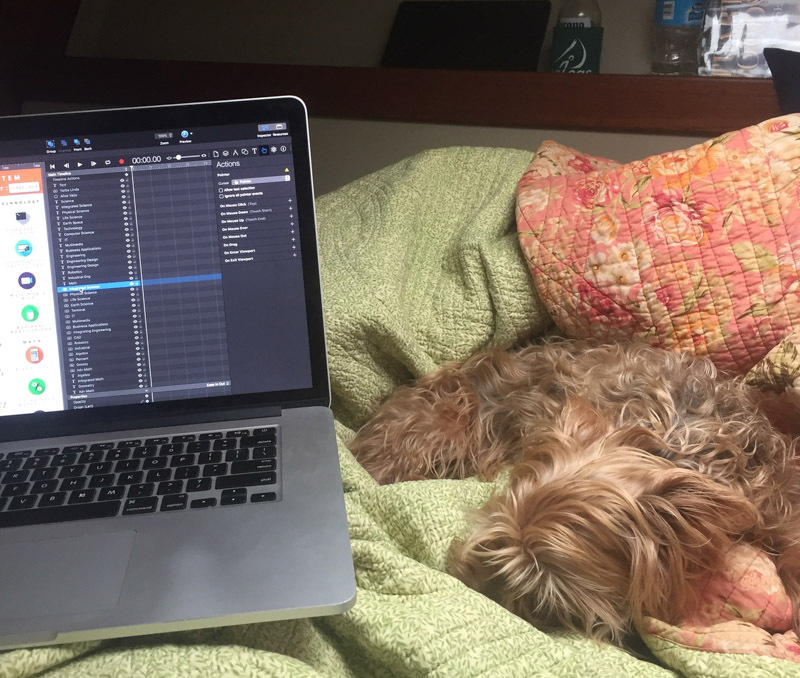 Rainy days are for napping and working in the V-Berth. 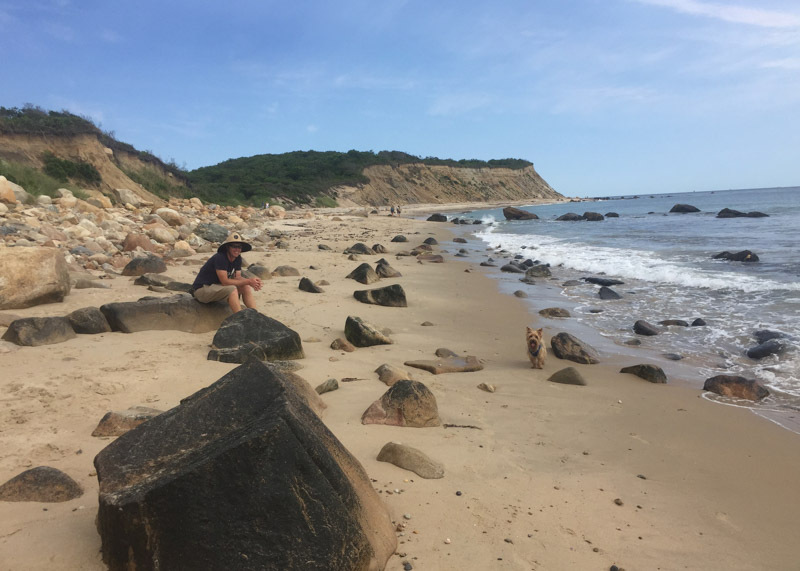 Sunday, we biked up to Mansion Beach and ClayHead on the NorthEast corner of the island. It was a beautiful day to be at the beach. Before heading back to Jamestown, we biked to Mahgoney Shoals at Paynes for a mudslide because you can’t come to Block and not have a mudslide. After lunch back on the boat, we were pulling up the anchor and sailing back. 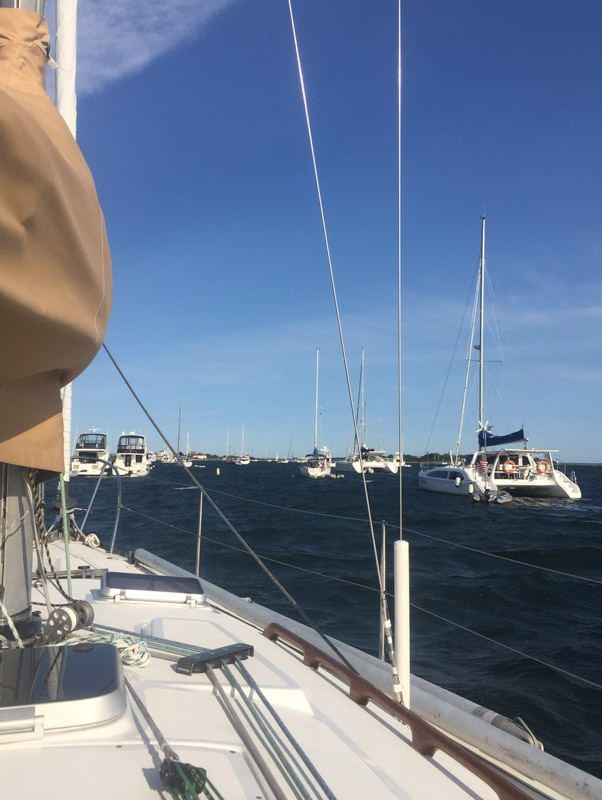 It was a Westerly (another weird thing for summer in New England) so once again, we sailed on Port Tack the entire way back to Jamestown. Strong Westerly in Block Island on Sunday morning. 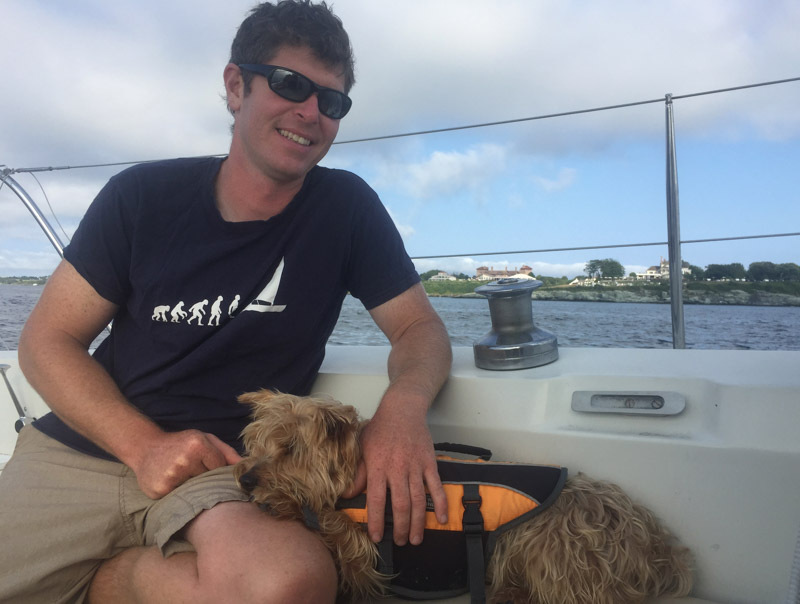 Two 30-Something Rhode Islanders sailing around on their C&C 34, Persistence, with their little dog Scruffy. 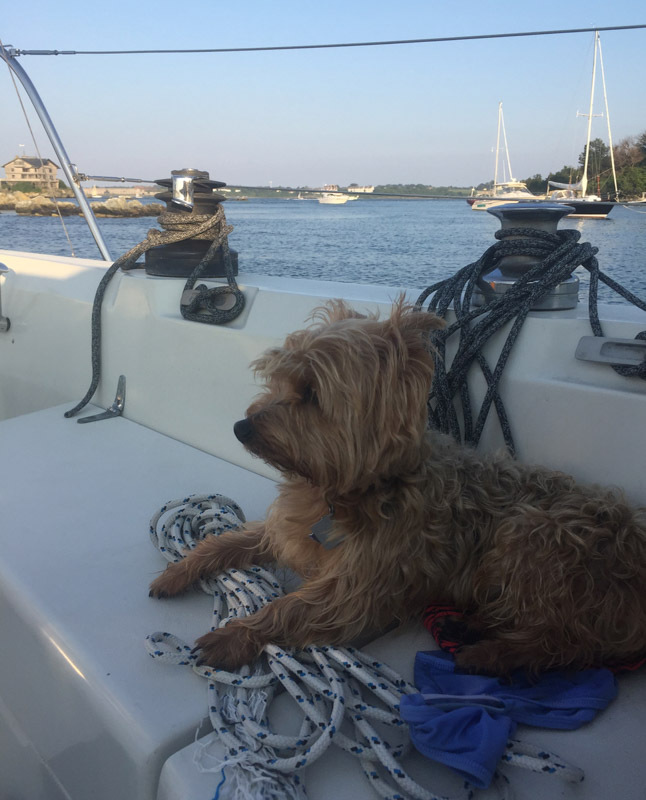 Two 30-Something Rhode Islanders sailing around on their C&C 34, Persistence, with their little dog Scruffy sharing their journey.